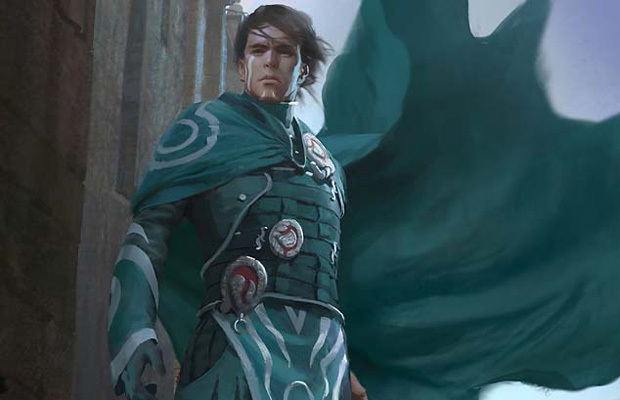 With Pro Tour Theros only a few days past, it is time to digest the results. We need to figure out what has changed, what to do about it, and what the future may hold. Advent of the Wurm: While Advent of the Wurm was certainly not a breakout, I would not completely say it is a “miss” either. Of the decks that scored more than 18 points in the Standard portion, There were 14 that were running Advent. Dublin appeared to be a bad town for GW though, so while Advent showed up, it did not gain much value this weekend. At least Chas Andres admitted to buying 20+ copies himself this Monday, so at least I know I’m in good company regarding my expectations of the card’s performance. Boon Satyr: There were 27 decks in the Top Decks portion that ran some number of this card, so we can say it was more successful than Advent. The price has not moved much to reflect this though. Perhaps in the next few weeks. Prime Speaker Zegana: Not a single copy in a single deck that scored 18 points or more. Loxodon Smiter: 19 decks running him, so not too bad. Still, no real price movement. Bow of Nylea: Three copies in the top decks. At least I didn’t oversell it. Heliod, God of the Sun: Nnnnnnnnnope. Ruric Thar & Sire of Insanity: While only one copy of Sire was floating around, Ruric had a decent amount of SB slots, but nowhere near enough to move his price. Reid Duke: 34th place. I’d consider that an exemplary performance. Good job Reid! All in all, I’d say my outlooks were pretty mediocre. This was mostly a miserable event for Selesnya in general. There were a fair bit of GW decks that made 18 points or better, but none that cracked the top eight. From what I have heard, most of them had a bad matchup against the MU decks, which if true would explain the mostly lackluster showing. I really liked Advent of the Wurm, Boon Satyr, and Loxodon Smiter, which all showed up, but Zegana and Cerberus were nowhere to be found. I did not predict any MU deck pieces or Nykthos, although I’m not beating myself up for missing the blue cards. In my defense, I picked up roughly 20 Nightveil Specters at $.66 awhile back when we learned about devotion, so at least I made a reasonable call on that. Of course, I did not bother to tell any of you about that last week, so it was hardly of help unless you follow me on Twitter and read my tweet when I bought them. So what were in fact the big gainers of the weekend? Master of Waves: Master saw the largest jump, going from ~$4 a week or two ago to right around $20 as of Monday the 14th. Not only did MU put three copies into the top 8, which is good news for the cards to begin with, it also managed to win both first and second place. Those types of results will skyrocket a card’s value. Where do we go from here with Master? Well, let’s talk about the deck itself first. I suspect the MU deck may follow the path of the spirit deck Finkel played at PT Honolulu in early 2012. While the deck performed well, putting 2 ½ copies into the top 8, that particular build mostly disappeared following the PT. Highly synergistic decks such as Spirits or MU can be great in a single-event metagame, but tend to not be sufficiently resilient when the format is ready for them. Contrast Finkel’s spirit deck from that event with Kibler’s winning GR Kessig Wolf Run list, which was a pile of very powerful cards. Kessig Wolf Run decks continued to be a major contender in the Standard metagame for months afterwards. The takeaway here is that I don’t believe MU is capable of thriving through weeks of sustained, dedicated hate. Having said that, Master of Waves is clearly a very powerful card. It is entirely possible we will see a significant transformation of the deck, which moves towards a more “good cards are good” build, a la typical Jund lists. If that is the case it is highly unlikely he will be capable of maintaining a $20 price tag, but $9-$13 seems like a reasonable place for him to settle. My advice is to sell Master of Waves at this time, and if he reaches ~$12, feel free to pick up a personal playset. An important thing to remember here is that Master has proven he is the real deal. If MU disappears and Master once more drops below $6, it will be time to start snatching them in trades. We will likely never be too far from seeing him come crashing over the levee on any given weekend. Thassa, God of the Sea: Thassa was another major winner on the weekend, jumping from ~$11 to a whopping $25 at one point. I was a big fan of her in my Theros review, calling her the best God in the set. I’m pleased to see that she is experiencing big-time success, although I wish she had gotten a little lower so I could have scooped up some copies first. Unlike Master, I think her prevalence elsewhere in the metagame will end up being more pronounced. While Master has very specific needs (a bunch of U symbols), Thassa just wants you to be capable of producing blue mana by turn three. We already can tell she is solid in control lists, and this weekend has shown she’s viable in more aggressive builds as well. The result of all of this is that while Thassa’s price is inflated, I doubt she will get as low as $11 anytime in the foreseeable future. I would guess that $15 is her floor for the medium term, with $20 possible if other mythics in the set keep dropping while she continues to see play. Right now her demand will be very high, as supply is still a bit constrained and she just spiked a PT. It is not likely many will be trading theirs away at FNM, so you should be able to capitalize on being one of the only guys in the room with any available. Unless you really need a personal set, ship now and reacquire when she is closer to $15. Nightveil Specter: With what I’m pretty confident is the largest percentage increase, from about $.66 to a whopping $5, Nightveil Specter is easily the largest beneficiary of the weekend. Not much to say here; ship all of your copies now. Even with sustained play, I doubt these are more than $2 in a few weeks. Nykthos, Shrine to Nyx: Prior to this PT, I think a lot of people were in the same boat as I was on this card. I could tell the card obviously had potential, but I was unsure of whether it was going to be a legitimate role-player or if it would turn into another Crypt of Agadeem. The reason I believe others shared this view was that the price was hovering right around $5, which says to me “we do not think this is bulk/commander yet, but we are unsure if it is good enough to charge $10+.” Well, this weekend settled that. Nykthos saw reasonable representation in the top 8 with 10 copies, but definitely proved its worth in Makihito’s deck when he was doing things like vomiting an unreal amount of permanents onto the board by turn four. By now we can see that it is obviously capable of doing some very busted things. Nykthos spiked to $15 and is currently somewhere around the $13 mark. Before you run around buying in at $10 each, remember that Deathrite Shaman has seen significant, sustained, ban-discussion-inducing Modern and Legacy play yet is still only about $13-15. There’s a real ceiling to values of in-print rares. I would sell any additional copies, and consider $5 to be the floor for Nykthos. Garruk, Caller of Beasts: Garruk only put four copies into the top 8, but Makihito’s GR deck took fourth, which is the highest place for a non-MU list. Garruk was easily the most remarkable card in the deck through the lens of MTG finance. Garruk has been rather quiet since M14, appearing only very occasionally, but is set to capitalize on the power of Nykthos. Garruk may be expensive at six mana, but Nykthos lets you get there quickly by unloading your hand and then he just completely refills for you. There are still copies available under $15, and I like Garruk that cheap. He never managed to dip below $12, so $15 is not much above what appears to be his floor. 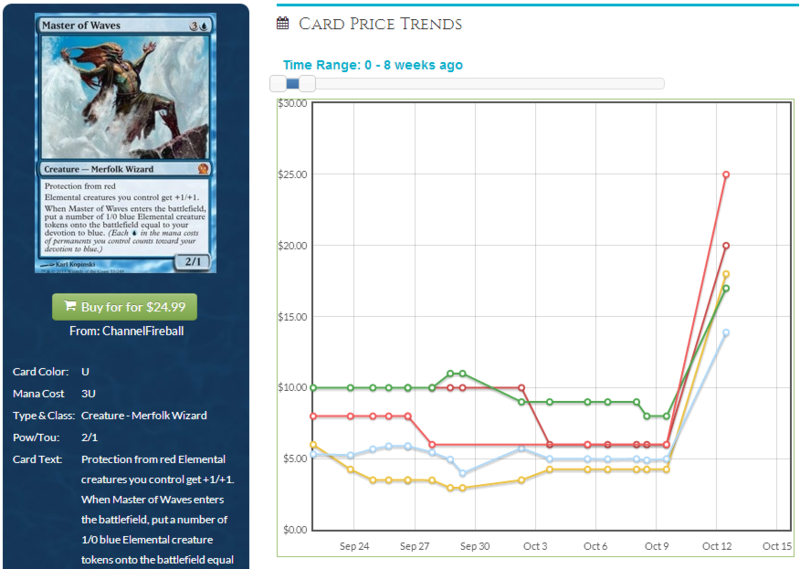 I don’t see him reaching Domri levels of play, but $17-22 seems plausible. Garruk was a question mark beforehand, but now that Nykthos is real, Garruk is too. I’d start trading for him this week. In addition to these cards, there were a lot of others that saw some amount of price movement based on the weekend or cemented themselves as legitimate parts of the metagame. 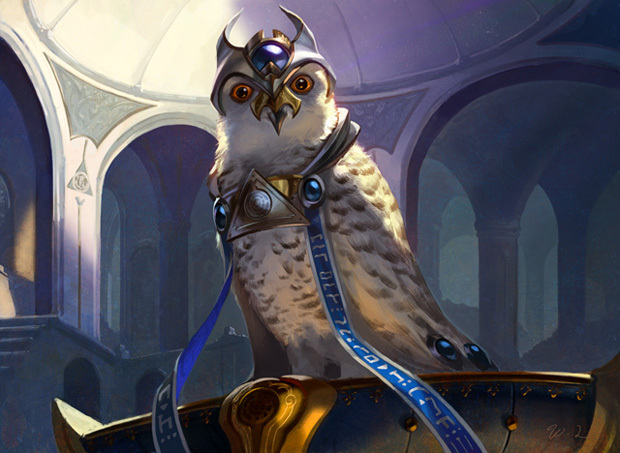 Finally, congratulations to Judge’s Familiar for taking down back-to-back Pro Tour wins as a maindeck four-of. One of the problems with Advent of the Wurm is that it’s in an event deck, and one with Temple Garden in it as well. This creates a real price cieling, as unlike the other rares in Dragon’s Maze, there’s an additional way to get your hands on just this card (as well as a pretty sweet dual land) for a pretty reasonable price. Being in an event deck doesn’t really matter much. Thragtusk was in multiple over the course of last year and still managed to be around $20 for a long period of time. Thragtusk was also a LOT more desirable, and went into a LOT more decks than Advent did/does. The Thragtusk event-deck printings were basically WotC doing what they could to prevent a $100 card from appearing in Standard.